When it comes to diving into the realm of B-movies/drive-in flicks from the 1950s and 60s, one expects to see some major turkeys. These films usually had titles that were infinitely more exciting than the actual film and their colorful posters promised terror beyond your wildest imagination as scientific abominations duked it out with each other or carried off some bikini clad bombshell into the unknown. Despite these enormous promises, all they ever delivered were bottom-of-the-barrel performances, chintzy make-up effects, no-budget special effects, cheesy monsters, and confused plots that failed to fully explain crucial elements of the story. Occasionally, one of these dreadful B-movie/drive-in flicks would be so bad that they’d actually be, well, semi-entertaining. One of these straight-to-double-bill features that manages to actually hold your attention is director Robert Gaffney’s 1965 cult classic Frankenstein Meets the Space Monster, a stock-footage heavy science-fiction/horror film that has everything from girls in skimpy bikinis to hulking extraterrestrials from outer space to an Atomic Age Frankenstein monster with a melting mug. It’s like something straight out of a forgotten comic book. Frankenstein Meets the Space Monster begins with an endangered alien race led by Princess Marcuzan (played by Marilyn Hanold) and her right-hand man Dr. Nadir (played by Lou Cutell) arriving in Earth’s atmosphere. The aliens, who are the sole survivors of an atomic war that took place on Mars, have arrived in an attempt to kidnap Earth women to breed with. The aliens instantly start monitoring and shooting down NASA space shuttles that they believe to be missiles being fired at their ship. Meanwhile, NASA is preparing to launch a brand new shuttle crewed by Colonel Frank Saunders (played by Robert Reilly), a charismatic android created by Dr. Adam Steele (played by James Karen) and Karen Grant (played by Nancy Marshall). Princess Marcuzan and Dr. Nadir proceed to attack the space shuttle operated by Frank, but they fail to kill him. Frank ejects at the last second and he lands in Puerto Rico with the aliens hot on his trail. After a face-to-face encounter with the aliens, Frank is horribly injured and his circuit board is badly damaged, causing him to turn into an unstoppable killing machine. With Frank’s killing spree distracting the army, the aliens begin snatching up as many women as they can get, but they inadvertently grab the U.S.’s attention after they abduct Karen. While most of these science-fiction/drive-in releases waited until the final moments of the film to show off their monsters, Frankenstein Meets the Space Monster can’t wait to yank the sheet off its two main beasts. The bloodthirsty android Frank is all-American good looks until he is on the receiving end of an alien laser blast, which melts off part of his face to reveal a fried circuit board. He consistently turns his head to show off his grizzly wound, which is actually sort of creative if you’re willing to forgive the fact that it looks like a piece of rubber pasted to the side of his face. He’s given a bit more personality through his charred space suit and his confused shuffle. The other beast that Gaffney allows us to marvel at is Mull, a radioactive creature that is held captive aboard the alien ship. Mull is largely seen in extreme close ups, partially hidden behind bars as he swipes his massive claws at the camera. He is mostly concealed until the final ten minutes of the film, when Dr. Nadir and Princess Marcuzan unleash him to do battle with malfunctioning Frank. Their battle is brief, but it is thrilling in a kitschy way. The two monsters look like they’re locked in a bear hug but Gaffney fills the set with thick smoke and deafening growls that really set the mood for the brawl. 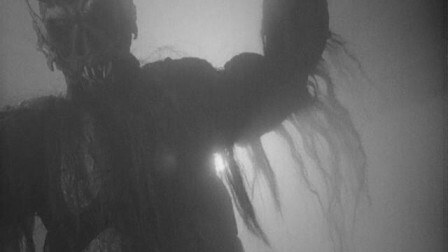 With so much emphasis placed on the cartoonish monsters, it is much easier to overlook the abysmally bad performances. Hanold is stiff and scripted as the evil Princess Marcuzan, the alien’s fearless leader who largely sits in a swivel chair and nods in approval at half-naked girls. Cutell is forced to wear some of the worst make-up effects you are ever likely to see but he doesn’t seem to be bothered, as his Dr. Nadir grins maniacally for the camera in extreme close ups. James Karen is given the heroic role as Dr. Adam Steele, who basically just rides a Vespa from place to place, looks worried, and reports to a bunch of lookalike army officials. Nancy Marshall barely registers as Dr. Steele’s pretty sidekick Karen, the only gal who seems to be afraid of the sinister aliens but she never challenges them. David Kerman is also present as General Bowers, but he blends in with all the other army officials. Reilly is the only one who does anything animated with his role as Frank, but his make-up does most of the work. Watching him wandering around the rocky landscape or trip and fall on the beach is vaguely sympathetic but with as many characters as this film has, it is difficult to really grow attached to him. With such a busy plotline and a brief runtime, Frankenstein Meets the Space Monster doesn’t have a wasted moment. A good majority of the film is comprised of stock footage of space shuttles taking off or soldiers pouring out of helicopters. Without this stock footage, Gaffney wouldn’t have been able to make the movie, as it makes up over half the picture. With the dueling plotlines and condensed runtime, Gaffney has a difficult time keeping both plotlines focused, leaving many questions unanswered. As far as the sets and props go, they all resemble something that you would have seen in an Ed Wood movie, but the swinging rock n’ roll soundtrack really keeps things moving along nicely. It should also be noted that despite the name “Frankenstein” appearing in the title, the film has little in common with Mary Shelley’s Frankenstein. 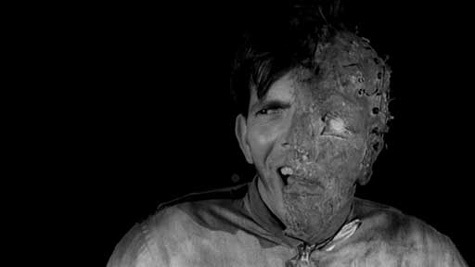 Overall, Frankenstein Meets the Space Monster is undoubtedly a slapdash effort, lacking any form of suspense, terror, coherency, or social or political commentary. However, the film does pack a number of unintentional laughs and a slew of performances that will have you blushing in embarrassment for the actor or actress. And if there are any other positives to be pointed out, the film has plenty of monster action to keep B-movie fans coming back for seconds and thirds. Frankenstein Meets the Space Monster is available on DVD. Posted on September 6, 2013, in REViEW and tagged 1965, b-movies, cult cinema, cult classics, david kerman, horror, james karen, lou cutell, marilyn hanold, nancy marshall, robert gaffney, robert reilly, science fiction. Bookmark the permalink. 3 Comments.